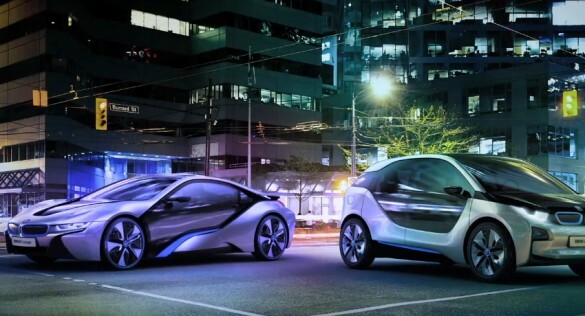 BMW has gotten a fair amount of exposure over its i-Series electric cars since originally debuting the Concept Vision Efficient Dynamics prototype in 2009. Unlike brands that show a concept and then abandon the idea as too complex or too expensive, BMW will put both the i3 and the i8 into production, with expected availability in late 2013. The i3 is designed to be an urban commuter car, with a limited range and modest performance. The i8 exists at the opposite end of the spectrum, as a no-holes-barred performance coupe that happens to be be fuel-efficient and green, too. As appealing as the concepts may be, there are still some ugly truths to face about electric cars. First up is their limited range: in the case of the i3, the battery-only version of the car is expected to have a maximum range of 100 miles, similar to a Nissan Leaf. In the real world, this translates to as few as 35 miles, depending upon environmental conditions and driving style. Also, there’s the issue of recharging in an urban environment to overcome, since most city-dwellers won’t have the ability to plug their cars in overnight. Opt for BMW’s REX range-extender in the i3, and most of the problems go away. Range is doubled, which should give the i3 driver a maximum range of between 160 and 200 miles (again, condition dependent). BMW isn’t clear if the i3 can be driven like the Chevy Volt, which can go from coast-to-coast if the owner tanks up every 300 miles or so. The other ugly truth about electric, range-extended electric and plug-in hybrid cars is their cost. Batteries are expensive, and so are lightweight materials. BMW has made significant advancements in material science (namely with carbon composites), but they’re not saying what the i3 or i8 will ultimately cost. This much is certain: don’t expect to snap up an i3 for the same price as a $35,200 Nissan Leaf. What’s you take on BMW’s i-Series? Is the world ready for a premium electric car brand, and would you be willing to pay the difference to buy a BMW EV over one from Nissan, Chevy or Mitsubishi?